Spanish fans danced the night away in a joyous fiesta after their first ever World Cup triumph, but silence fell across the Netherlands as the country again tasted the bitterness of defeat. A thunderous roar erupted from a sea of people dressed in red and gold in Madrid as Spain -- perennial World Cup underachievers -- lifted the trophy after a nailbiting 1-0 extra-time win in South Africa. In Madrid the deafening sounds of cheering, klaxons, firecrackers and cars horns rang out after Spain won the trophy in their first appearance in the final thanks to a late goal from Andres Iniesta. "The dream has come true," said the El Pais daily on its website. Supporters of the Spanish team wave a Spanish flag in celebration after the World Cup final football match Spain against Netherlands in Barcelona. Prime Minister Jose Luis Rodriguez Zapatero said he was "happy and emotional. "This has been an epic match, I suffered like never before," he told Cadena Ser radio. In blistering heat, more than 150,000 supporters watched the match on massive screens in a giant fan park in a one-kilometre (half-mile) stretch of the city's main thoroughfare. "We are very proud and very happy, I thought it would go to penalties, Iniesta saved us," said Raul, 18. "We deserved it after winning the European championship in 2008." Said Adolfo, 25, "It's an extraordinary feeling, of happiness and nerves." Others crammed into bars or gathered at home for the match, which left the country paralysed for two and a half hours Sunday evening. Most were either wrapped in the Spanish flag, wore the red team shirts or red wigs, or had their faces painted red and gold. One young woman was disguised as an octopus, in tribute to Paul, the now famous clairvoyant cephalopod in Germany who predicted Spain's victory. "Spain, Spain, Spain!" screamed the daily El Mundo in a headline on its website. "This World Cup has crowned one of the best teams of all time." "Iniesta took us up into heaven" after an "agonising" game, said the sports daily Marca. "We suffered, but it was worth it." Thousands of fans had earlier poured into the capital from other parts of the country to soak up the atmosphere, many travelling all night and planning to leave the next morning after a night of revelry. "We're going to celebrate like crazy, all night, all Monday, until Tuesday morning," said Miguel Angel, 41, who had traveled from the northern city of Bilbao for the match. More than 2,000 police officers were on duty in the capital in case of incidents, along with medical teams, who treated dozens of people who suffered amid the stifling heat and the crush of supporters in the fan park. Almost all towns and cities throughout the country installed giant screens for people to watch the match. There was even excitement in Catalonia, a region with its own distinct culture and language and which has traditionally been disdainful of the Spanish national team. Authorities in the Catalan capital of Barcelona set up a giant outdoor fan park for the final for the first time during the tournament, where authorities said around 75,000 people watched the match. 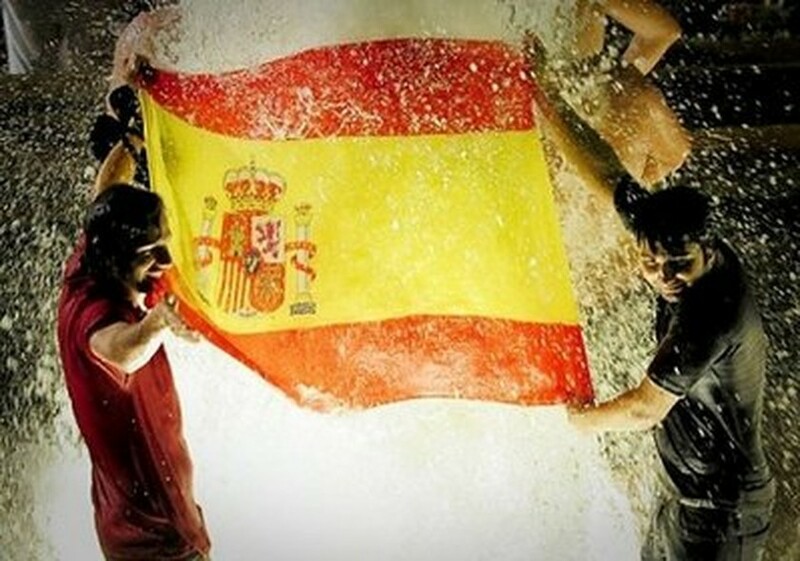 The crowd erupted with joy and waved Spanish flags, with many in tears, at the historic victory. The players will be feted in a parade in an open-top bus that will pass through central Madrid on Monday evening, ahead of a reception by Zapatero. Dutch fans reacted with disbelief to the 1-0 World Cup final loss, as silence fell on an Amsterdam square where about 180,000 football fans saw the defeat on big TV screens. As the final whistle blew, some supporters on the Dutch capital's Museumplein (Museum Square) rested their heads in their hands as the earlier festive atmosphere turned somber and a cacophony of vuvuzelas suddenly died down. Some cried, others sank down to the ground; many started leaving the square in grim silence directly after the 1-0 extra time defeat, abandoning their beers and throwing their orange supporters' T-shirts to the ground. "It is unbelievable, it is very disappointing," 19-year-old Rafi Friedmann told AFP, his face painted in the red, blue and white colours of the Dutch flag and sitting on a park bench with a dispirited air. "We came so far, we made it to extra time, and then we lose with such an idiotic goal," he said. "We feel bad. It is the third time that we lose a final. It was now or never," said Farid Hamdi, 22, a Dutch flag draped over his shoulders. Orange fans of all ages had gathered countrywide on squares, in bars and at each other's homes for the final clash. The Dutch teams returns to the Netherlands late Monday morning, escorted into Dutch air space by an F-16 fighter jet painted orange. They would then be taken with a military helicopter to a hotel to meet their loved ones, according to the Dutch defence ministry. The team is due to meet Queen Beatrix and outgoing Prime Minister Balkenende on Tuesday before an official welcome in the Amsterdam city centre on Tuesday.